Lulu is five and a half years old and gave her family a big scare when she went missing on January 13. When a family new to the area made the move across the country from Philadelphia to plant their roots here in Truckee, they never dreamed that their biggest heartache would ultimately show them that this is where they belong. 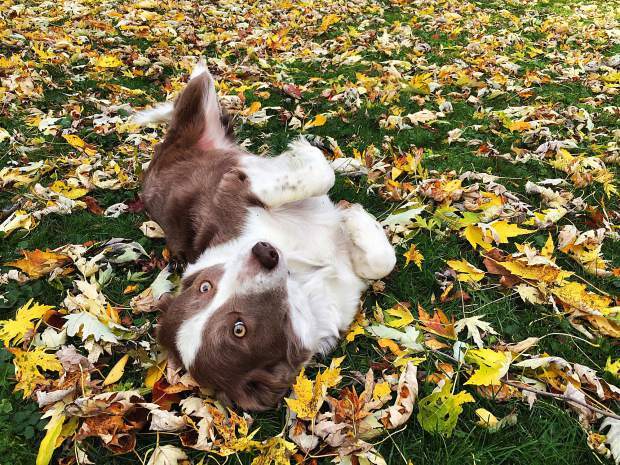 April Reigart and her husband rescued their 5-year, 6-month-old border collie, Lulu, about two years ago from Lancaster, Pa., where she says Lulu worked as a breeding dog for a puppy mill. “The place was a house of horrors, we reported it and there was nothing they could do … Lulu came out of her cage and pressed herself against my leg and just looked at me and I knew I had to get the dog, she asked me to,” she said. After six months of talking down the business owner he finally agreed to sell Lulu to the couple. Four months ago, April, her husband, their son and Lulu moved to Truckee after dreaming about it for nearly a decade. “My husband loves Truckee, my son loves it, and my dog loves it more than anybody. I love it more after this experience because I am literally blown away by how amazing the community is here,” she said. On Jan. 13, April and her husband packed up their things to bring their son on a family trip to the Bay Area, leaving the family dog, Lulu, with a well-known friend of theirs who lives on Donner Summit. “We literally walked into our hotel room and that’s when we got the call that she was gone,” she said. Reigart said that Lulu had never run from her owners before and that she knew their friend, his house and the surrounding area well, so when he notified them on vacation they expected she would come back. “In hindsight I wish we would have come back immediately. but in the moment it kept unfolding and it was too late to drive with our son, we didn’t tell him right away because we knew it would be awful,” she said. By the next morning, with no sight or sound of Lulu, the family headed back to Truckee and let their 7 year old know that Lulu was still making her way home. As the days went on April said she and her husband kept good faith that Lulu would return, but soon it was their son who really kept their hope strong. “My son went crazy to get her back, but he never thought that he wouldn’t get her back. He’s only 7 so we kept pumping him full of support and showing him the support from the community, assuring him,” Reigart said. “It would be snowing and we would be crying but he never knew it, his language was always ‘When Lulu comes back we’re going to play this,’ or, ‘I really need a fluffy dog here, I really would like Lulu to be here,’” she added. She said that her husband was relentless in searching for the family dog, even staying on the summit for four nights in a row, sleeping on the ground just to keep an eye and ear out where they thought she might be. 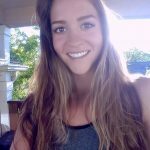 Reigart turned to social media to spread the word about Lulu going missing and the news created a ripple through Truckee that she said she never expected. “It was huge, just, it blew my mind. I was like, ‘I don’t know what magic is at work here.’ But so many people cared, would offer encouraging words, jumped in, asking ‘Where should I look I have some time today I’m going to hike around and look for your dog,’” she said. Reigart said that her family was feeling particularly down right after moving to Truckee and that losing Lulu would have been almost too much to bear had they not felt completely supported by the Truckee community. “I was just really feeling about as heartbroken to have other losses and things going on, this was just the last straw. But every day someone would tell me stories about their dogs and how they found them in crazy situations. They kept pouring in words of encouragement and it really taught me, it kept my spirits up and gave me hope,” she said. It wasn’t until Jan. 27 that Reigart’s husband, Justin, finally posted to social media what felt like the best news the Truckee community had heard in a while. After weeks of potential Lulu sightings posted online, signage hung all around the area and community members pitching in to help, it was a snowmobiler named Rob who finally brought Lulu home from all the way out in the Jackson Meadows area. “When the snowmobile guys found her, Rob was the one who pursued her for miles on foot and it made all the difference. He could have let her go but he went the extra mile, literally, and he did it, he chased her until she couldn’t go anymore and that was it,” Reigart said. She describes Lulu as being depleted and exhausted when she returned, but steadily getting better. Though a stomach-wrenching ordeal to have to go through, Reigart and her husband feel so much support from the community they say that Truckee is a truly special place that came through for them in their time of need without even knowing the impact. 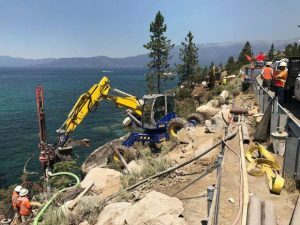 “I don’t know how I can ever thank all of the people from the Tahoe area for what they did, and I’m sure they think it doesn’t matter that they left a comment but it added up into something that kept me, my husband and my son going. We never lost hope and I know it’s because of all of the people who talked to us, posted and hiked,” she said.